45 RPM single record with picture sleeve – limited to 500 copies worldwide! •	Two original rockers recorded by Dale Hawkins for Chess/Checker Records in 1957, and 1959. •	First time ever pressed on high quality vinyl, 7inch. •	Produced by legendary Leonard Chess. •	Featuring guitar players Roy Buchanan, Carl Adams and Kenny Paulsen. •	Picture sleeve. Strictly limited to 500 copies worldwide! A Rockabilly Hall of Fame member, Dale Hawkins was born in 1938. Along with others, he created a sound that was often referred to as ’Swamp Rock’ and helped shaping original Rock ’n’ Roll music. 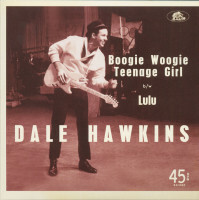 Hawkins was a talented singer and songwriter, recording artist, bandleader and producer, and cousin to Ronnie Hawkins. Suzie Q, a tremendous hit for him in 1957, will remain his trademark song. Hawkins made his greatest recordings for the famed Chicago blues outfit, Chess/Checker Records. He was one of only a handful of white artists that Leonard Chess produced for his labels. Chess was known for its expertise in electric urban Blues and original Rhythm and Blues. 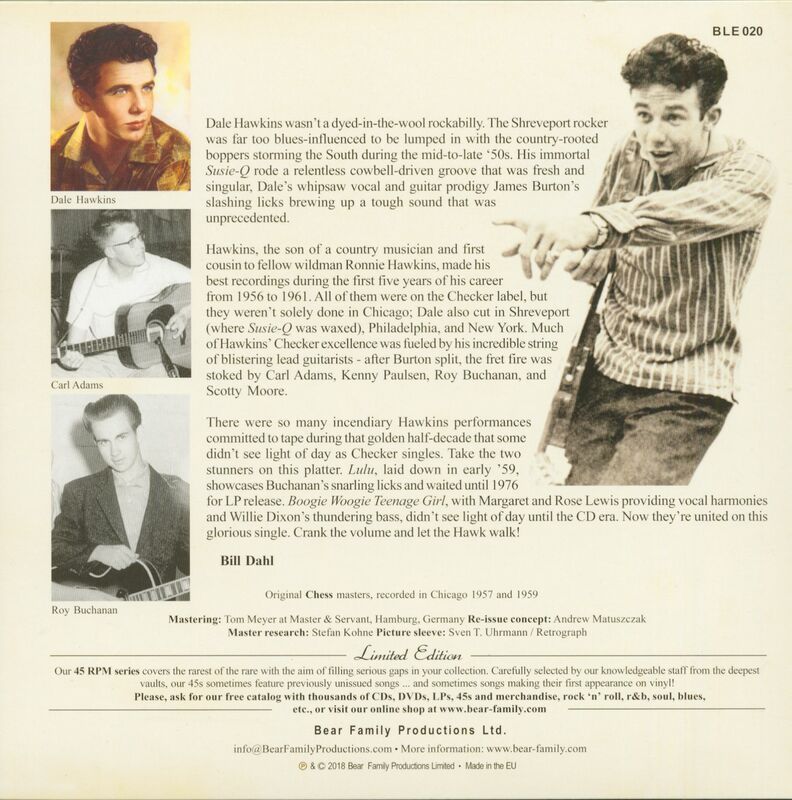 James Burton, a Rock & Roll Hall of Fame inductee himself, was among a fine list of great guitarists that performed in Dale Hawkins’ band. Others were Fred Carter Jr, Roy Buchanan, Joe Osborn, and Scotty Moore. For this 7inch 45 RPM records we have picked two fantastisc rockers, masters from his superb Chess catalog. Both songs are now available on 45 for the first time, ever! 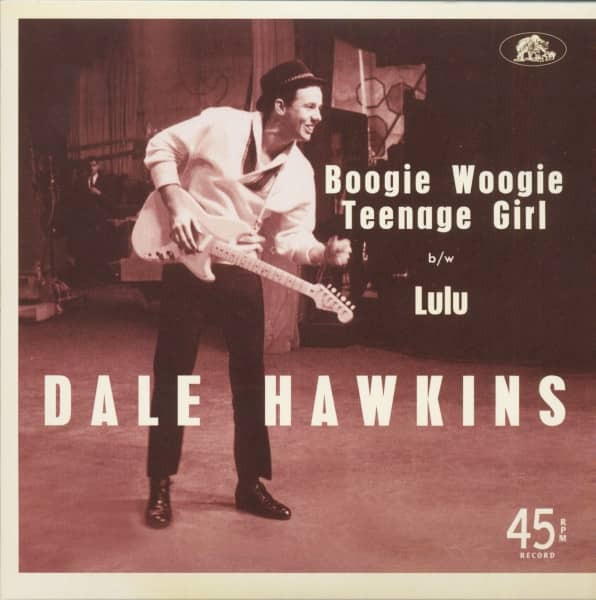 Boogie Woogie Teenage Girl, recorded in 1957, is a hard-driving mid-tempo Rock ’n’ Roll jiver in a class of ist own. This recording is guaranteed to get everyone on the dance floor! According to our files, Dale Hawkins, Carl Adams and Kenny Paulsen are the guitar players on this number, Margret and Rose Lewis are listed as background vocalists. The flip side, Lulu, a guitar-driven Chicago style rocker from 1958, has the potential to become a cult record. Here Dale Hawkins is featured on guitar, along with a young Roy Buchanan and Kenny Paulsen. Both titles have been produced by Leonard Chess. Bear Family’s high-quality 45 release is strictly limited to 500 copies worldwide! 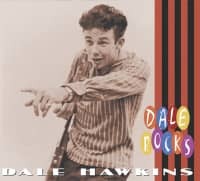 Dale Hawkins may be short on the recognition that blesses other 50s rock 'n'rollers but that's a blessing of a kind. He's still a legend with records that are sought after and, for the most part, well worth seeking out. 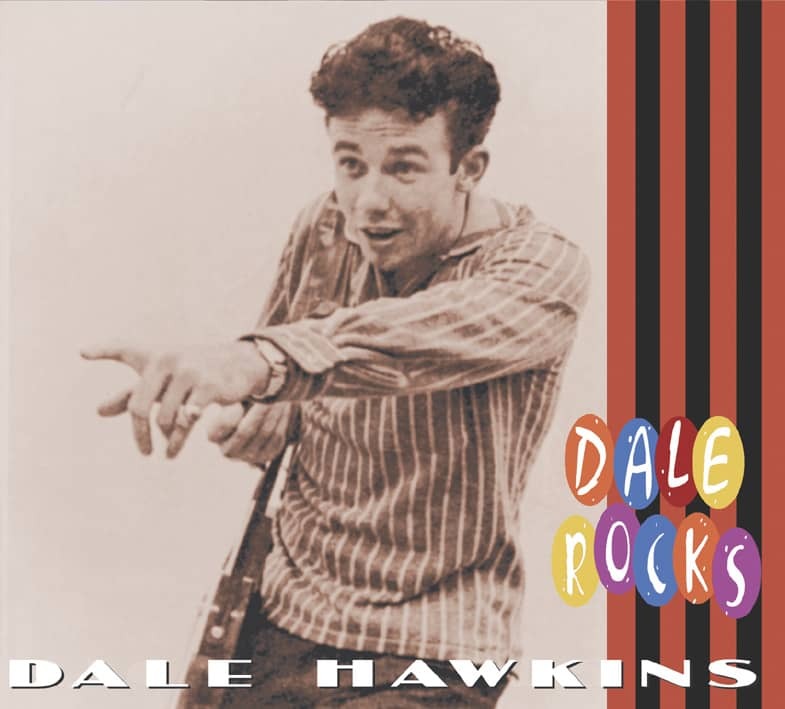 Although Susie-Q is the song by which he is best remembered today there was more to Dale Hawkins - a whole lot more - and that's what this essential collection of first division Louisiana rockabilly is all about. Delmar Allen Hawkins was born on August 22, 1936 in Goldmine, Louisiana, a tiny pin-prick on the atlas some thirty miles from Ferriday. His mother, Estelle, taught in the tiny farming community's only school while his father, Delmar Sr, played a variety of instruments in local hillbilly bands. There was one sibling, Jerry (sixteen months younger), whose three singles on Ebb have long intrigued rockabilly collectors though they made little impression at the time. Cousin Ronnie Hawkins (Dale's dad and Ronnie's dad were brothers) grew up to the North in Arkansas but he and Dale shared a common musical heritage and an uncommon talent for making some of the most infectious rock 'n' roll records of all. Hawkins's parents separated when he was three and his father died in an accidental fire. Dale was shunted around a succession of share-cropping relatives in Mangham, just South of Shreveport, and Bossier City where he attended high school. Black music embraced Hawkins from all sides. He stood outside the local black church where the congregation screamed and rolled in the aisles. He was exposed to country blues in the cotton fields where he toiled alongside black field hands after school. Battered instruments emerged during breaks and Hawkins joined in on a guitar he'd obtained by selling newspapers. The experience left an indelible imprint on all that was to come. At 16, he enlisted in the Navy where he remained for a year and a half. After the Navy he returned to Shreveport where he abandoned a college course for a career in music. Records by Lonnie Johnson, Howlin' Wolf and Guitar Slim filled the jukeboxes and Hawkins, who took a job as a counter clerk in Stan Lewis's Shreveport record store, helped to sell them becoming an expert on the R&B hits of the day. At night, he sang the blues in clubs along the Bossier City strip across the Red River from Shreveport. This three-mile stretch was crammed with bars and honky-tonks like the Hi-Lo, The Sho-Bar, The Boom Boom Room, The Nite Owl, The Skyway and The It'll Do Club. Servicemen from nearby Barksdale Air Force base regarded the Strip as the focal point of entertainment. It was the hot spot for local bands and the stuff of greasy high school dreams. Hawkins's early bands included young musicians whose experience already embraced work on The Louisiana Hayride. This live country music show, networked from Shreveport's radio KWKH since 1948, was now emerging as an unofficial nursery for aspiring rockabillies. James Burton, born in Minden, Louisiana in 1939, played lead guitar in a fluid, apparently effortless style which evolved from hearing the C&W stars he accompanied on the Hayride and blues guitarists, Gatemouth Brown and others, which Hawkins made him listen to. Burton was so young he needed a police permit each time he played in a club. Fred Carter, another Hayride guitarist, also figured in some of Hawkins's earliest Shreveport line-ups. He went on to play with Ronnie Hawkins and Conway Twitty, eventually settling in Nashville where he joined the A-team, the city's finest session cadre. The inner circle contained bass players like Frank Homer Kirkland who accomplished greater things with Bob Luman and Ricky Nelson, Tommy Mandina, an Italian-American pal of Stan Lewis's, and James 'Sonny' Trammell, an older man who ordinarily played steel on the Hayride and greatly influenced James Burton. Drummers included Anthony J Tuminello and Nick Roppolo who, like Burton, was too young to hold a social security number. There were times, Hawkins told Cub Koda, when the band would ride to gigs on bicycles. In 1956 Hawkins paid Bob Sullivan, KWKH's engineer, $25 for some post-midnight studio time when the station went off the air for a couple of hours. Hawkins's friend, Bobby Charles, had got on Chess with See You Later Alligator and Hawkins hoped to follow suit with a demo tape of See You Soon Baboon. One story suggests that the demo was aired by KWKH deejay Charles 'Chuck' Dunaway (later and more famously on Milwaukee's WRIT) prompting an exceptional response from listeners. Things happened in a flurry which becomes more uncertain with the re-telling but it all boiled down to a management deal with Stan Lewis who pitched the tape to Chess, the mighty Chicago blues label whose owner, Leonard Chess, was a frequent visitor to Stan The Man's Record Shop, the main Louisiana distributor of Chess Records. Hawkins's first single, released in June 1956 on the Checker subsidiary, coupled See You Soon Baboon and Four Letter Word, both products of the KWKH studio on which John 'Sonny' Jones's guitar licks are overwhelmed by an unknown saxophonist. The Jones brothers, Alton and John, played the same clubs and bars as Hawkins and Al co-wrote Swing Daddy Swing for Dale's brother, Jerry. Dale helped Al Jones get a deal with Poplar Records where Jones recorded the near-hit Mad Mad World; the song appeared as Wild Wild World on Dale's 'Oh! Suzy Q' album but Dale believes he was the first to cut it (Jones's record was reviewed in 'Billboard' on December 2, 1957). Dancers were Doin' The Susie-Q - steps which evolved from the Lindy Hop and virtually synonymous Jitterbug - at least as far back as the mid-30s when the song, written by J Fred Coots and Benny Davis, featured in The Cotton Club Revue of 1936. Harlem's Savoy Ballroom was at the forefront of these trends in black choreography but the dance probably came up from Southern jukejoints along with blacks who sought economic security in the North. Either way, its popularity crossed barriers which divided white middle-class suburbs from rural black communities. Lil Armstrong cut Doin' The Susie-Q but so did white bandleader Joe Haymes and blonde bombshell Ina Ray Hutton who shimmied in front of her all-femme orchestra in a transparent chiffon trouser-suit. Calypso artist, Raphael de Leon (aka 'The Lion') recorded Susi Qu in Trinidad in 1940. Billy Briggs's western swing band cut a song called Susie Q for the Time label out of Dalhart, Texas in 1950. Black blues variants had already formed a long queue: Lil Johnson's Grandpa Said 'Let's Susie-Q. Harlem Susie Kue by Victoria Spivey, Stop Truckin' And Susi-Q from Tampa Red and, on Bluebird in 1938, Susie-Q by Sonny Boy Williamson. Customer evaluation for "Boogie Woogie Teenage Girl - Lulu (7inch, 45rpm, PS)"